Michael St. John's project of representing the world, from the banal to the incredible, the disheartening to the hopeful, engenders nothing less than a recalibration of vision and notions of value. Creating a circuit of visual information, St. John's representation of the everyday changes the way a viewer sees his or her world. 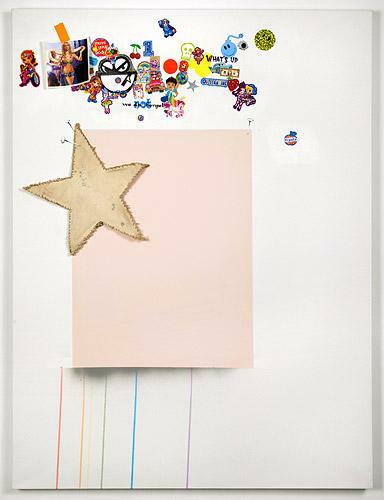 Underlying its humor and clever nods to popular culture, St. John's work is subtended by a current of empathy and deep responsibility; and Andrea Rosen Gallery is so pleased to present his second Gallery 2 exhibition, In the Studio Twenty Eleven. The collected elements of these works refer to the range of St. John's multivalent practice, but stand together as a particular and concise body of work. 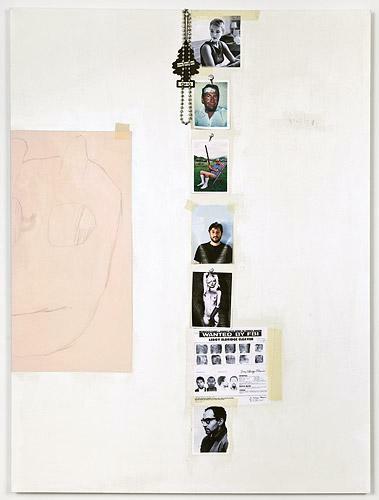 As the title of the exhibition suggests, the most central source image and idea for this exhibition is Jasper John's painting "In the Studio", 1981. 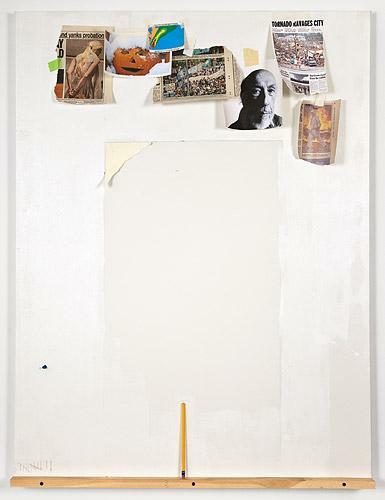 Jasper John's "In the Studio" follows a familiar trope of artists painting their studios but radically departs from convention by incorporating three dimensional, painted sculptural elements to create multiple layers of illusion. The addition of sculptural elements in combination with tromp l'oeil painting is deeply influential to St. John's work. 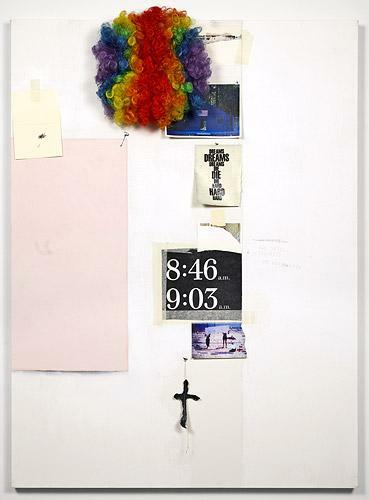 St. John's paintings, however, utilize the form of Jasper John's work while breaking the hermeticism of the studio. Incorporating images and objects from the real world, St. John enacts a similar kind of operation but in his hands the collapse of the painted surface with the real world serves as a way to elevate the incredible, everyday gestures that exist unnoticed. 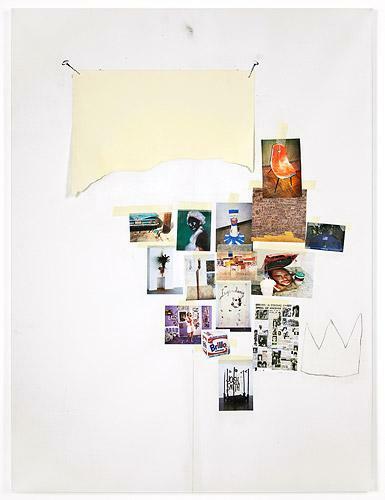 Evoking Robert Rauschenberg's combination of painted surface and found images in "Rebus", 1955, the format of the works also mimic the way that images and small objects can be taped or tacked to a wall in homes or studios. 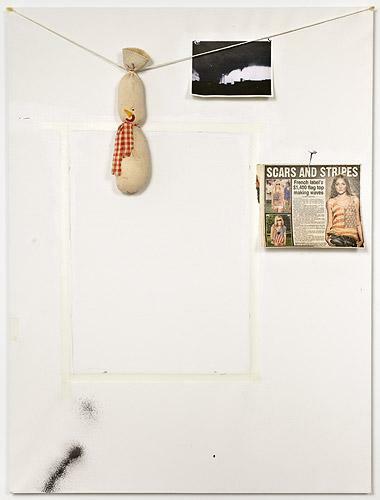 These makeshift bulletin boards are so ubiquitous that they escape notice, and yet these seemingly small acts reflect the meaning that images and objects can have. 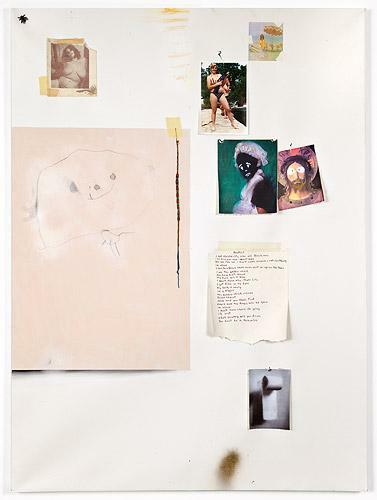 It was an image and a description of Patti Smith standing next to a wall of taped up photographs from her book Just Kids that trigged St. John's immediate recognition of the importance of these spatial arrangements as expressions of subjectivity and the ad hoc creation of ritualistic sites. 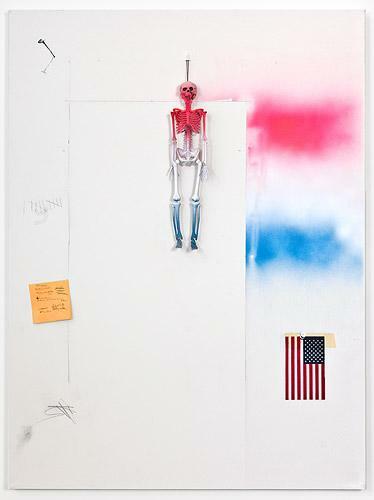 St. John's work reflects his constant interrogation of the full range of visual culture. By representing the overlooked and commonplace, St. John elevates what would normally be failed or hidden efforts at communication. The artist reframes small gestures of public address (bathroom graffiti, stickers on notebooks, lost dog signs) in a way that can lend more power to individual expression against the occupation of public space by corporate advertising. While this methodology of working can seem so current, St. John has been working in this mode for nearly two decades and has been a teacher and mentor to a younger generation of artists. 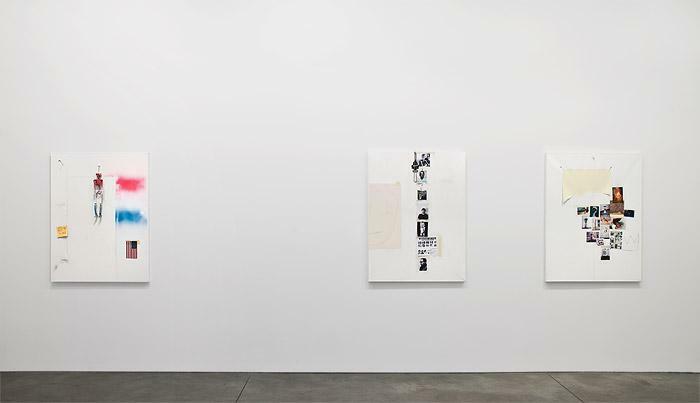 St. John's work embodies the democratization of images that has become a larger part of our culture with the ever expanding role played by the internet and social media. 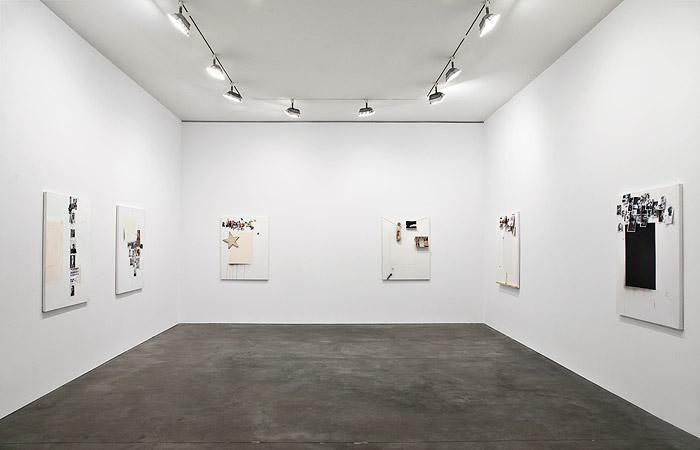 Rather than relying on the apparatus of media corporations, however, St. John's works is decidedly personal. Eschewing spectacle and in spite of their subtle means and modest scale, St. John's work always reflects the artist's careful handling of materials and painstaking formal construction. The artist's work makes a case for the persistence and relevance of art as a means of encouraging the simple act of looking carefully and seeing critically. Michael St. John lives and works in Massachusetts and New York. 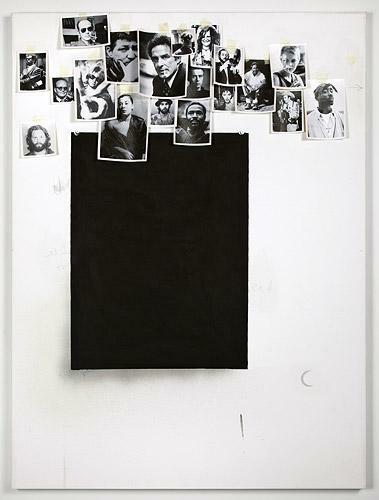 This will be St. John's 11th solo exhibition in New York. He has also been included in numerous group exhibitions. 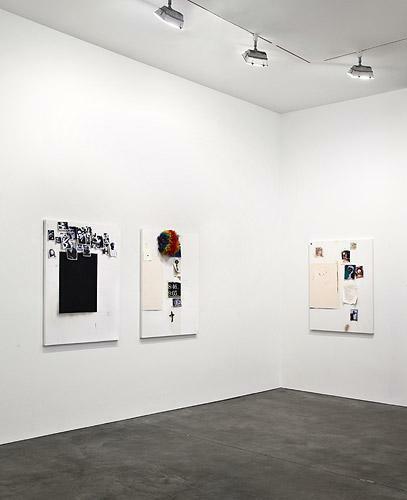 Along with an extensive resume of curatorships, St. John has held numerous teaching positions including his position as an adjunct professor at New York University since 1994.